In May of 2014, members of the Utah State University Student Academy of Audiology embarked on their 10th Mission from the hEARt. The organization and logistics were planned in conjunction with the Non Profit Organization: “Fundación Su Niño No Puede Esperar” and the Audiology Clinic “Clinica Audiomed” in El Salvador. Students traveled around the country to provide hearing services to underprivileged communities. They visited schools, clinics, hospitals and schools for the Deaf. It is well known that in many developing countries such El Salvador, patients living in remote areas have never had access to hearing healthcare and often require professional attention and intervention. 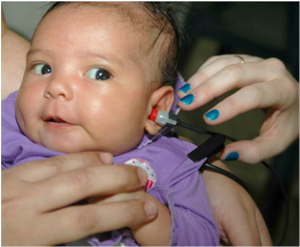 In El Salvador, there is no universal hearing-screening program, and there is a lack of attention of the importance of early detection and intervention of hearing loss in newborns. The age of hearing loss diagnosis is around 8 years old. The lack of trained audiologists makes the situation even harder. Underprivileged communities are not educated in hearing health; there is not education among the Salvadorian population related to the importance of early detection and intervention of hearing loss. Parents, teachers, physicians, and even the Ministry of Health often do not understand the importance of early detection and intervention programs, and the huge social impact that this disability causes. During the week the mission provided hearing tests to approximately 2,000 children (age range 0-12 years old) and fit over 200 hearing aids. They also provided cerumen management and made medical referrals. Each patient will be tracked for follow up services through the “Fundación Su Niño No Puede Esperar”. In collaboration with Peak ENT, Dr. Spencer Darley and Dr. Juan Caballero performed ear surgeries in which patients were implanted with the Ponto bone anchored hearing system. Mastoidectomies and tympanoplasties for patients with chronic otitis media were also performed. This Humanitarian mission was just the start of a long term process, in which the final goal is to provide Audiology services, educate the communities, and create awareness within the health systems. Additionally we hope to demonstrate the huge need in the Audiology field, so that early hearing detection and intervention (EHDI) programs can be approved to help children receive amplification options early enough to enable normal language and speech development. This mission would not have been possible without the work and help of so many wonderful individuals. The USU Student Academy of Audiology held fundraisers for the mission including the Olive Osmond Hearing Fund 5K, “Run 4 Hearing”, Valentine’s Day treat sales, and custom ear mold sales. Generous donations were received from the USU Communicative Disorders & Deaf Education department, USU Hearing Clinic patients, friends and relatives. The Oticon Foundation awarded a grant to purchase digital hearing aids. Weston donated ear mold material and supplies. Rayovac supplied batteries for the hearing aids. Bionix contributed cerumen removal supplies. Peak ENT provided medical supplies and materials for the ear surgeries as well as hearing aids. The International Rotary Club furnished money to cover meals and transportation. 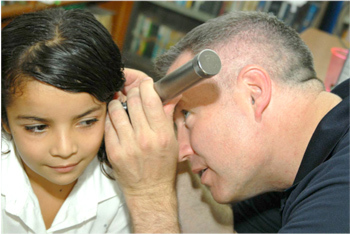 The Ministry of Health and Ministry of Education of El Salvador helped to coordinate the locations and invited patients to attend the audiology services. All the efforts and donations were greatly appreciated and changed the life of many in need!